Stupava is a picturesque town situated at the foot of the Little Carpathian Mountains, just a few kilometers from the capital city - Bratislava. 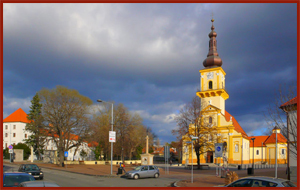 It is a city that is a gateway to an area called Záhorie, is rich in historical monuments, equipped with good infrastructure (shops, services, pensions, hotels, restaurants, sport areas, biking and hiking trails, etc.). Pension GreenHof, located 500 meters from the town center, aims to satisfy its visitors by providing accommodation at a high level of quality for outstanding prices. The main aim is to provide very good ratio of value and services. Copyright © 2009-2017 greenhof.sk. All rights reserved.